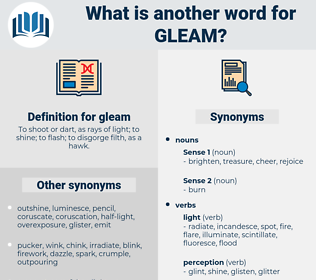 What is another word for gleam? To shoot or dart, as rays of light; to shine; to flash; to disgorge filth, as a hawk. 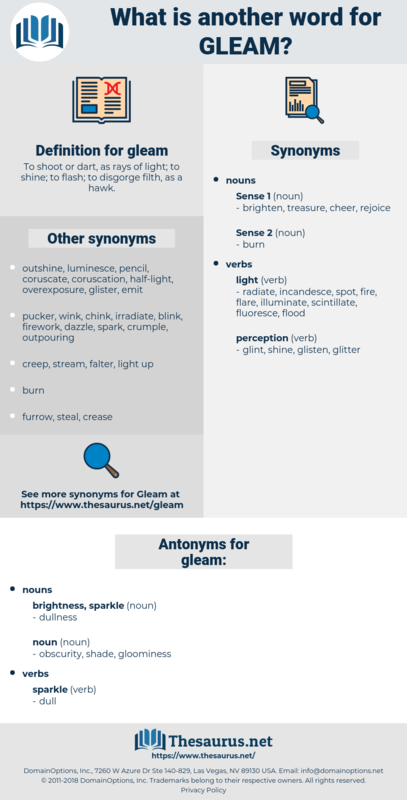 glow, Nota, ray, beacon, beam, light, glimpse, spark, frontline. Their eyes were weary with dust and gleam, The day had gone like an empty dream.
" I'll give you a look at me without waiting for the lantern," said Tom quickly, and he struck a match, holding it so that the gleam fell upon his face. radiancy, effulgence, radiance, shine, refulgency, refulgence.